SIZE : 900 MM DIA X 5 MM. The company is well known in the market for the supply of a wide range of Fiber Glass Cylinders. These Fiber glass Cylinders are available in various applications like Power type transformers, EHV Test transformers and test equipments & Tap changers. This product is made up of filament wound cylinder and epoxy resin bonded. We are one of the leading supplier and manufacturer of D.M. Plant FRP Cylinder. Other sizes are available as per requirement and drawing. 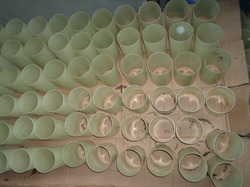 We manufacture fibreglass cylinders by filament winding process by hoop winding or cross winding. we manufacture cylinders for a maximum of 2000mm OD and 2000mm Length. Fibreglass / Glass reinforced plastic (GRP) cylinders are mainly used for insulation purpose, Tapchangers, Transformers , other electrical insulation applications. We have manufacturing Fiberglass barrel for use in dry type transformers, as per buyer's specification. Length: Up to 3 mtr. 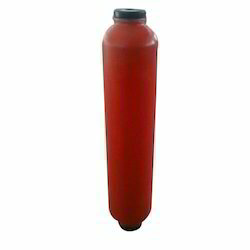 We are highly acknowledged organization engaged in presenting a remarkable range of Fiberglass Cylinder. Our FRP Cylinder (DM Cartridge) & Mixed Base Resin are extensively catered by water treatment plants for utilizing in varied applications. It is an efficient product designed with the assistance of hi tech modern technology. Length: Up to 2.1 mtr. Vidarbha Water Nano Technology (P). Ltd.